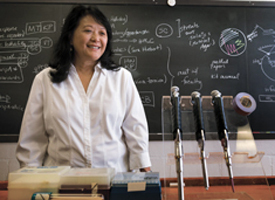 A music professor playing the pipettes … A historian running the centrifuge … A dean counting bacteria on a petri dish … You never quite know whom you might run into in Amy Cheng Vollmer’s microbiology lab—and she likes it that way. Every summer, Vollmer, professor of biology, invites Swarthmore faculty members and administrators to spend a few days working in her lab. 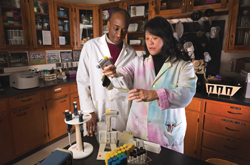 Philip Jefferson, Centennial Professor of Economics, and Cheryl Grood, associate professor of mathematics, volunteered to be the first guinea pigs, in 2005. They were followed in 2007 by Barbara Milewski, associate professor of music, and Bruce Maxwell ’80, formerly of the engineering department. In 2011, Professor of History Tim Burke donned the lab coat. And in 2012, Leslie Hempling and Melissa Mandos of the dean’s office proved that administrators can cultivate bacteria, too. The main purpose behind Vollmer’s embedded-faculty program is to break down the wall that divides the sciences from the arts and humanities—the “two cultures” made famous (or infamous) by C.P. Snow in a lecture in 1959. 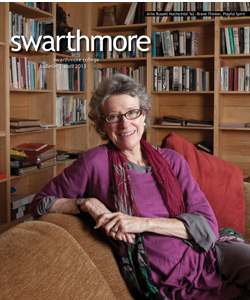 “I read Snow’s lecture, and my reaction was that it’s the same today, if not worse, even at a liberal arts institution like Swarthmore,” Vollmer says. She mentions an eye-opening study, conducted by Professor of Engineering Lynne Molter ’79 in the early 2000s that showed how Swarthmore students fulfill their distribution requirements. A third of the humanities and social-science majors took only three natural science courses (the minimum requirement for graduation) and did not take a single course with a lab component. These students missed the chance to see for themselves the main way that scientists acquire information about the world. Vollmer thinks that lab work is particularly important for students because the process of doing science is largely hidden both in the media and in scientists’ own writing. “It is like the bottom of the iceberg, which you don’t see but which makes up 90 percent of the iceberg,” Vollmer says. Jefferson showed up at her lab the next morning. But he still didn’t want to put on a lab coat. “I told Philip, I’ll just drape the lab coat over the chair here, because it gets cold. Within a week he was wearing it, and at the end of the summer he gave a talk to his department wearing the coat!” Vollmer says. Jefferson has since become one of the most enthusiastic evangelists for the program. In 2005 he wrote an article about his experience for The Chronicle of Higher Education. His main motivation had been to understand better how scientists design experiments, because there has been a movement in economics toward mimicking the approach of natural scientists. He was very impressed with the “discipline” he learned in Vollmer’s lab, the design of step-by-step protocols to eliminate possible sources of error, and it inspired him to design statistical protocols for use in his econometrics course. With her embedded-faculty program, Amy Cheng Vollmer aims to break down the wall between the sciences and humanities. Burke, on the other hand, was fascinated to see how Vollmer dealt with people with a broad range of competence in the same laboratory, from her “fumble-fingered” history colleague to a first-year student to a highly skilled rising senior. Jefferson and Burke, who are on the steering committee for Swarthmore’s new Institute for the Liberal Arts, see Vollmer’s initiative as exactly the kind of interdisciplinary contact the institute should promote. And in fact, the institute has already sponsored another initiative of Vollmer’s that began in fall 2012. “I stuck my neck out last spring and wrote to the president and provost to propose a science café for the staff,” Vollmer says. “They replied almost immediately. Rebecca [Chopp] said this would be a perfect thing for our Institute for the Liberal Arts to sponsor as an inaugural event.” The Second Tuesday Science Café gives the staff and faculty a chance to eat lunch, hear a faculty member discuss his or her work or other scientific matters of current interest, and ask questions. Listen to Professor Vollmer’s Science Café lecture on the immune system here.